Vibrant Button Tree on Canvas | mizzeliz – working for you..
Buttons aren’t just for seamstresses you know. I always have a stash of buttons on hand for a variety of projects. I love using them with kid’s crafts, they are great for dressing up little projects, and perfect for a quick embellishment. Buttons definitely have more uses than just fastening a blouse closed. This button tree I finished today is a perfect example. I was presented with a challenge by the fine folks at Buttons Galore and More andJacquard Products to come up with a project using these gorgeous three dimensional paints and a variety of stunning buttons. I am always up for a good craft challenge, so of course I said yes! There’s a bonus too. Jacquard and Buttons Galore have offered to provide a prize package to one lucky reader. You’ll receive the same beautiful paints that I did and will be able to choose some fabulous buttons as well! I’ll tell you more about the giveaway at the end of this post, so stick around. I’ve had a brand new, still in the shrink wrap, 20″x24″ wrapped canvas sitting in my craft room for months. I bought it because it was on sale and I knew I wanted to make something like this tree, though I assumed I would be painting the whole thing. As I started brainstorming for the challenge, that’s when it hit me to make a button tree. I’ve seen several different kinds aroundthe web , but I hadn’t seen any using dimensional paint. 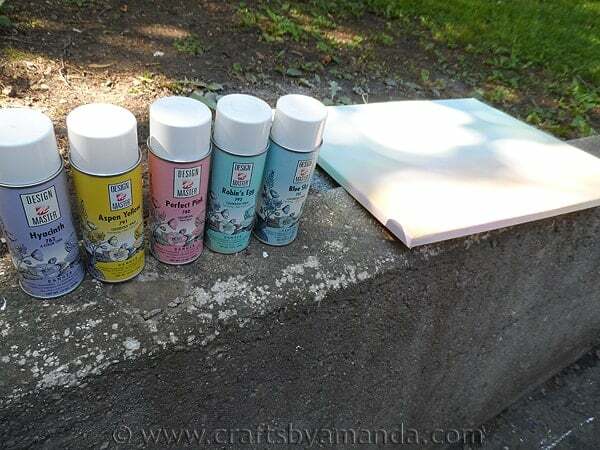 So I pulled out the canvas and some pastel colored spray paints I had in the craft room. I started with light blue, spraying one end of the canvas. Then I overlapped a bit with Robin’s Egg Blue, then some purple. I sprayed the other end with pink, then over-sprayed with yellow. Then I just willy nilly sprayed some blue here, yellow there, purple here, until I liked the way it looked. I allowed the canvas to dry for about an hour. I drew a simple tree trunk onto the canvas, sketching lightly with a pencil. I drew 5 main branches, then added smaller branches off of those. When I was happy with it I used a brown metallic finish paint to fill in the tree. I used a liner brush on the smaller branches. This is where I had a little fun with the dimensional paints! I chose the colors Black, Brass, Bright Copper and Gold Pearl. These paints come out in a nice steady stream and looked beautiful, adding a really nice dimension to the canvas. Next I chose some of the largest buttons in each of the button collections. I was using Rustic Coconut Shell (my favorites! ), Sea Glass, Earthly, Vacation and Rose Garden. I placed them in various places on the canvas. Once I was happy with their placement, I attached them with E6000 adhesive. It took a little while, but I just kept adding different sized and colored buttons everywhere, saving the tiniest buttons for the outer edges. That’s it! A little spray paint for background effect, a simple tree drawing filled in with paint, some shimmering three dimensional paint, lots of beautiful colored buttons and some glue. Posted in: Crafting and decorating, New uses for every day things..